Effective Strategic planning and execution is the foundation for achieving success in any organization, whether government or private enterprise. Failure to plan is planning to fail. Meanwhile, many organizations that plan, and exert so much energy in planning, do not record much success, mainly because most of the plans end up on the shelf without putting actions to the plan. In all, whether failure to plan or non-execution of plans, to poor execution as is the case with some organizations, the result is always the same, lack of performance or call it failure. In contemporary management, consistently performing organizations are the ones which have avoided the path taken by these poor performing enterprises and which chose a strategy planning and execution model that integrates planning and implementation in a systematic approach as offered by the Balanced Scorecard. An integrated strategic planning and performance management system that communicates with clarity an organization’s vision, mission, and strategy to employees and other stakeholders, aligns day-to-day work to vision and strategy, provides a framework for prioritizing programs, projects, services, products and resources, and uses strategic performance measures and targets to measure progress. This tool is what the Bank of Ghana has deployed in planning and implementing its organization–wide strategy, one of few organizations in the west coast of Africa to fully deploy the Balanced Scorecard methodology. One unique features of the Balanced Scorecard system is that it aligns all of the organization around strategy to ensure focus across the organisation and to improve overall performance. It also measures performance across four dimensions, namely Stakeholders, Financial stewardship, internal process and organisational capacity as against the traditional performance measurement method of judging performance using mainly financial success. The process leading to the adoption of the Balanced Scorecard system in strategic planning and implementation in Bank of Ghana stated with an international Request for Proposal (RFP) to which Balanced Scorecard West Africa (BSWA) responded and won the bid. BSWA commenced work with planning and facilitating the setting up of cross–functional teams to work with the BSWA team of consultants. These teams were then taken through training and capacity building programs in various aspects of Balanced Scorecard up to certification as Balanced Scorecard Professionals, which certifications were issued jointly by The George Washington University College of Professional Studies, Washington DC, USA and the Balanced Scorecard Institute, our Global partner. In total 88 Directors and top management staff of the Bank were successfully trained in readiness for the strategic planning exercise. The whole essence of the training and capacity building is to ensure continuity of implementation, when the consultants have finished the assignment and left the client’s site. The training also facilitated easy buy–in of top management and staff, a critical requirement in the successful implementation of strategy in any organization. 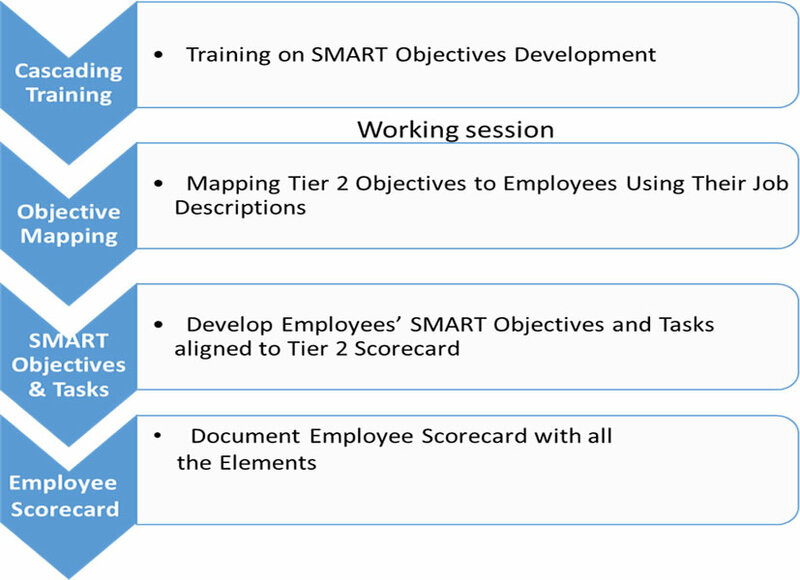 The scorecard was built using the Nine Steps to Success framework (see figure below) developed by the Balanced Scorecard Institute, North Carolina, USA. This involved a scan of the external and internal environment of the organization. BSWA commissioned a macroeconomic study of Ghana as part of the external environment and also ran a customer needs analysis leading to the development of customer value preposition and strategy profile. A good strategy must address identified needs/challenges in the external and internal environments of any organization. The main outcomes of Step 1 was the refinement and re-validation of the Bank’s Vision, Mission and Core Values and Customer Value Proposition. The ground was also laid in Step 1 for the development of the Bank’s strategic thrusts in the next five years. Strategy is the positioning of choices and set of actions taken by an organization to move from its current position to a more desirable future state. For the Bank of Ghana however, the strategy formulation stage was heavily influenced by the Bank’s core mandate. Thus six key Strategic Responsibilities were identified as the main Strategic Thrusts to propel the Bank to success in the planning horizon, 2018 to 2022. 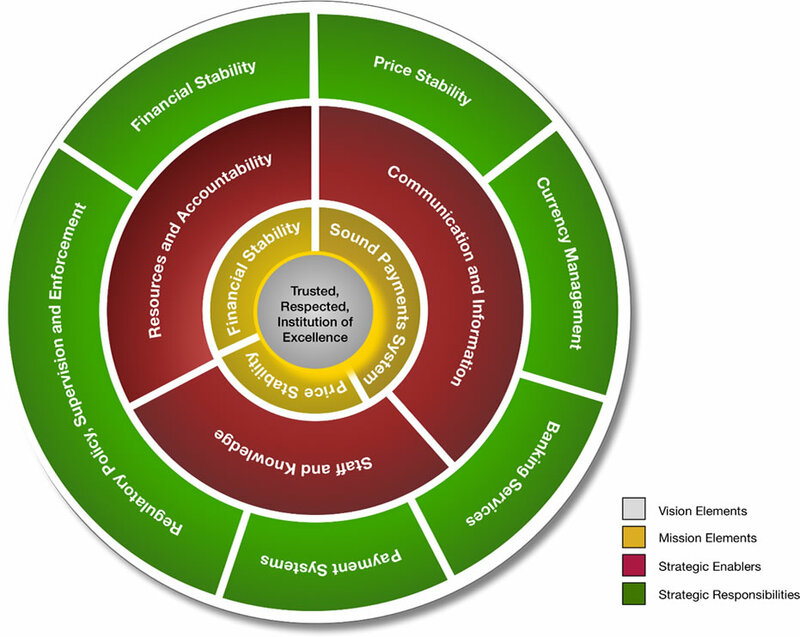 The Strategic Responsibilities are graphically presented below. A set of three Strategic Enablers were also identified which represent the enabling environment to deliver on the Strategic Responsibilities. These two key elements of the Bank’s Strategy are the foundations upon which the achievement of the Bank’s Mission and Vision depend. Strategic objectives are continuous improvement activities that need to be carried out to achieve the Vision and Mission of the organization. They are the DNA or building blocks of strategy. Each strategic objective has an intended result to be achieved which are measurable. Thus, the Strategic Responsibilities and Strategic Enablers were decomposed to measurable Strategic Objectives and Outcomes for the Bank in the planning period. Strategic objectives are the only elements of strategy that are translated through the process of cascading to lower levels of the organization. Performance measures are evidence that performance has occurred. They are also referred to as key performance Indicators or KPI’s. Performance Measures and Measures Definitions were developed for all Strategic Objectives. With the Performance Measures, the Bank is able to track progress of strategy execution and take corrective actions if the desired outcomes are not achieved. Strategic Initiatives are short, medium- or long-term projects that need to be carried out to deliver specific strategic objectives. Along with the Strategic Responsibilities and Strategic Enablers and related Strategic Objectives and Outcomes, Key Actions or Strategic Initiatives were identified which the Bank must implement to drive achievement of its Strategy. Thus the Initiatives are tied to their deliverables, i.e. the Outcomes, which can be tracked and monitored through the Performance Measures. Having successfully developed the Enterprise Strategy, the stage was set for a role out of the Strategy. In order to effectively communicate the Strategy, create buy-in among staff and enlist their support, a “Face” of the Bank’s new Plan was agreed that is rooted in the country’s folklore, the Black Star. Thus, the Face of the new Strategy is “STAR 2022” denoting – Strategy (executed with) Teamwork Achieves Result. “STAR 2022” was formally launched at an impressive ceremony framed with music provided by the Bank’s Choir. Alignment ensures that what every department, business unit, individual and team does are aligned with the enterprise strategy. Alignment creates a strategy–focused organization and makes strategy actionable. This is done through a cascading process where the strategic objectives at higher levels of the organization are translated to lower levels, which are then tracked with their defined KPI’s. An important part of the work at this stage was the development of detail KPI Definition Tables for all the Performance Measures to facilitate easy implementation and tracking of performance. Evaluation involves assessing the whole process of the strategy implementation to ascertain if the organization is achieving what it has set out to achieve, i.e. assessing the success of strategy. This is a feedback mechanism that may require adjustments to certain elements of the strategy, where desired success is not being achieved. It must be noted that strategy is a living document that is not cast in stone, which may require adjustments especially when it is obvious that certain elements in the external or internal environment of the organization have changed that will impact on the successful implementation of the strategy. Achieving success in strategic planning and implementation, though not an easy task, can be made easier when a disciplined approach is followed. 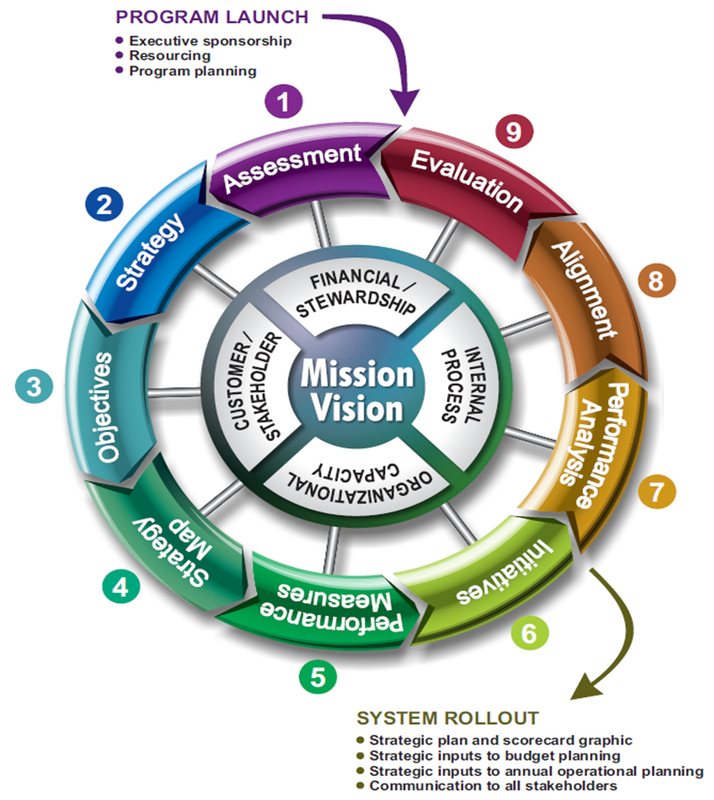 Such an approach which has been deployed worldwide is the Nine Steps to Success framework. The framework has been deployed for profit and non–profit and governmental organizations with tremendous success. The same framework formed the basis of the development of the Bank of Ghana’s Strategy summarized above and will underpin the Strategy implementation. BSWA’s engagement with the Bank for its 2018 – 2022 Strategic Planning process has been a rewarding experience for both parties. The BSWA team thanks the Bank’s Management for the opportunity to be of service.